For the past two weeks flows on the Lower Kern River have been at great levels for whitewater rafting. We’ve held our breaths and waited to see if flows would hold or fall and it’s become apparent that the great water levels are here to stay. We are now officially opening the Lower Kern River to rafting on May 1st. This is the earliest date we have ever offered California’s most popular two-day rafting trip. Be part of rafting history on the Kern River by joining us for our earliest Lower Kern opening day trip ever. 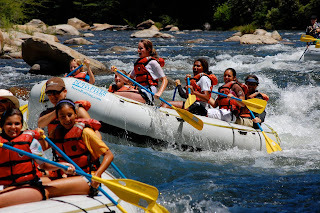 The Lower Kern River features the best class III and IV whitewater rafting in California. Our two-day trips spend the night at the best and most luxurious private camp (see photos here) on the river. It is located approximately half-way through the 20 mile run which gives our customers two 10 mile days of excellent rafting. Give us a call today to reserve space on our May 1st/2nd two-day Lower Kern rafting trip at 1-800-323-4234.